HDMI, Bidirectional RS−232 & IR over Extended Range HDBaseT Twisted Pair Transmitter. 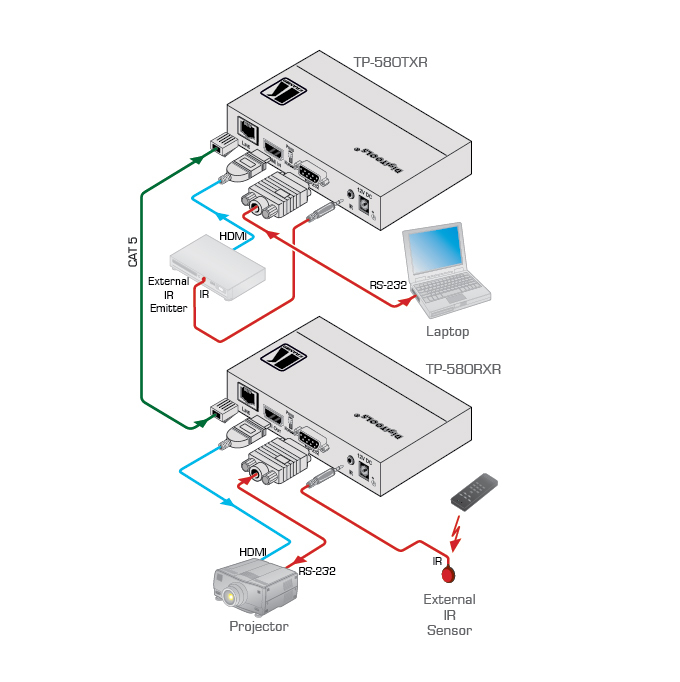 The TP-580TXR is an extended range, HDBaseT twisted pair transmitter for HDMI, bidirectional RS-232 and IR signals. 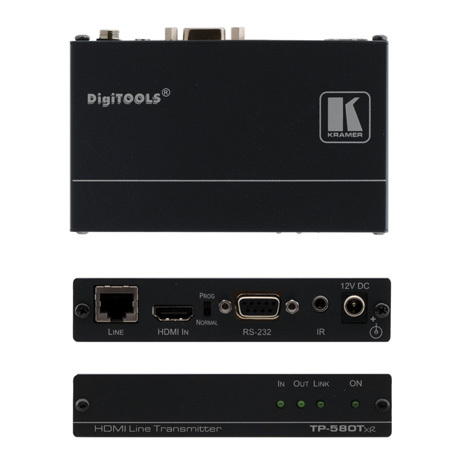 The TP-580TXR inputs HDMI, RS-232, and IR signals and converts them into an HDBaseT twisted pair signal that it transmits to a TP-580RXR receiver. SKU: 791585. Category: Range Extenders. Bidirectional RS-232 & IR Interface. – Commands and data can flow in both directions via the RS−232 interface, allowing status requests and remote control of the destination unit. System Range – Up to 130m (430ft) normal mode; up to 180m (590ft) ultra mode (1080p @60Hz @24bpp) when using BC−HDKat6a cables. Cable – For optimum range and performance using HDBaseT™, use Kramer’s BC−HDKat6a cable. Note that the transmission range depends on the signal resolution, source and display used. The distance using non−Kramer CAT 6 cable may not reach these ranges. OUTPUTS: 1 HDBaseT twisted pair RJ−45 connector. POWER CONSUMPTION: 12V DC, 295mA. DIMENSIONS: 12cm x 7.6cm x 2.4cm (4.7″ x 3″ x 1.0″) W, D, H.
OPTIONS: RK−3T 19” rack mount.